Like for every larger trip comes the big question of what camera gear should I take along and finding the right answer is usually rather difficult if you have many options to choose from. If I remember correctly, for last year’s summer vacation, I have taken two Nikon SLR bodies, the FM3a and a FM2 together with a couple of prime lenses and a Nikon Ti35. This year, I opt again for Nikon (FM3a, F100 and J5) but I add my latest acquisition, which I simply call “the beast”: a Fujica GW690 Professional, the first model, fully manual coupled range finder camera, without light meter but with a fixed 90mm f/3,5 lens. I was not actively looking for this camera, let alone any non-35mm body, given I just recently got a Contax RTS which I have started to CLA, so it was a big coincidence that one of my active search agents on willhaben.at alerted me on this camera, simply because the previous owner mentioned “Contax” in his text describing the Fujica et voilà, not even 24h later I am the proud owner of this wonderful camera and immediately decided to take it along together with some of my 120 film rolls that are patiently waiting in the fridge for more useful times. I have chosen the Nikon F100 with a couple of AF Nikkors (35-70mm f/2,8, 60mm f/2,8 Macro (or Micro as Nikon calls it) and a 20mm f/2,8, my widest full frame Nikon lens) because I had some issues last year with focusing on the manual Nikons and (in my opinion) too many shots were not sharp, hence the AF capability. Also, I take a Tamron 70-300mm with built-in stabilisation, in order to get some potential shots of remote objects with sufficient sharpness. The FM3a with the 35~70mm f/3,5 and the 50mm f/1,4 are always with me, so no exception now and the Voigtlaender VF101 simply because it is small and has a film in it which I would like to finish. I call it my “going-out” cam. Last but not least the smallest system camera I own: the Nikon 1 J5 with a 10-30mm zoom. Its my wife’s camera too when we are travelling. Rounding up the total pack, a light-weight tripod, a monopod, two Nikon flashlights (SB-30 and SB-800) and some more accessories such as the belts, UV filters, hoods, etc. should not be missing and all is neatly packed in a weekender bag. 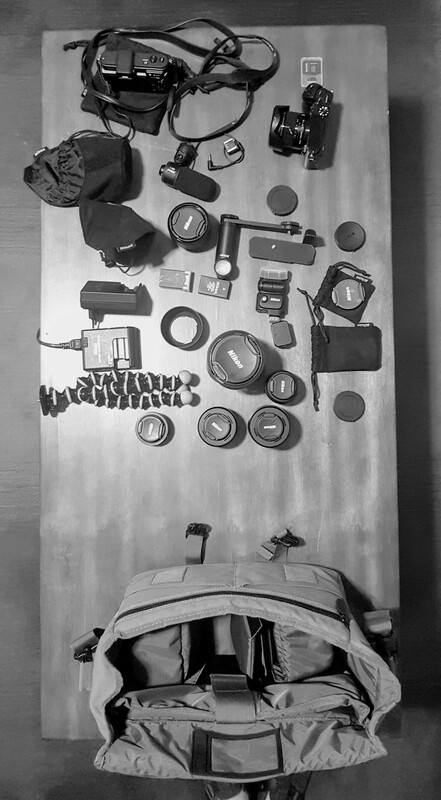 When shooting, I will use a small rucksack and fill it with the gear I want to use that day. So, here we go, I am ready for some vacation and looking forward to many nice pictures and the writing of more stories about my experience with the gear. Before I forget, this was some other packing done! A couple of weeks ago I was meeting with some UK-friends in Zagreb at the INmusic festival. I wanted to shoot some pictures during our stay and decided to go for two cameras: the Nikon FM3a and a RF from Voigtländer, the VF 101. Both are sturdy and lightweight at the same time. The meter of the VF 101 was just working fine and given the music bands were having their gigs in the evening, I packed for the FM3a a fast 1.4 50mm lens, a little flash (Nikon SB-30) which I could use for both cameras and fast film (which however I eventually decided not to use). The whole kit weighs just over 2.5kg which is not too much for me considering I was carrying it in the middle of the crowds during a concert. Also, the Billingham allowed for a very easy access to the gear without having to fiddle with zippers. Though I love the 35~70mm with its built-in Macro function, I’ve decided to mostly take the 50 and 28mm only thus saving half a kg and make space for my spray to fight the mosquitoes. Also, there’s no big difference between 35 and 28mm on the wide end and for day light shooting, I would take the body with the zoom lens only without the bag. The SB-30 is probably the smallest Nikon TTL flashlight for their film cameras and aside of the non-TTL automatic mode it even has some rudimentary manual mode and exposure compensation, enough for most use-cases and the Voigtländer. In combination with the FM3a, I achieved great fill-lights, if not too far away give its guide number of 16/52 (at 28mm angle of coverage, ISO 100, m/ft, 20°C/68°F). Talking of films, I’ve been experimenting with different types and eventually, for general purpose shooting, I like the Fujifilm SUPERIA 200 the most as it has a rather balanced color rendition. The Ektar 100 is great for summer days to give a lot of warmth but it blows out the reds very quickly. The Portra 160 is a great portrait film and I shoot it usually at 100 to give a light touch to the pictures. For shooting during at night / very little available light, my absolute star is the ILFORD Delta 3200, shot in combination with a fast prime lens. The Voigtländer VF 101 is a small coupled AE rangefinder camera. I just got it very recently from one of my favourite 2nd hand shops in Vienna: Leicashop. (Check the Vintage section). Developed by Voigtländer and produced in the mid Seventies by Rollei, it most likely also has its genes for the lens from Zeiss Ikon, as the Color Skopar 40mm looks a lot like a Tessar. Shooting with the VF 101 is a joy, provided there’s enough light. In the dark, it was difficult for me to focus given the tiny overlay image of the coupled range finder function was not really of a big help. The camera is super-silent, hence rather non-intrusive, however, due to my lack of experience when shooting RF cameras, it took me sometimes more time than anticipated to do some basic adjustments, I am obviously not Henri Cartier-Bresson. Holding it is a joy, as you get the impression of holding a sturdy little block of metal and it weighs just over half a kilo. On my way to Zagreb, I did a stop-over in Maribor and Ptuj Castle, both lovely places in Slovenia, so the coming pictures are from the whole trip. As stated in a previous post, my favourite combo (currently)for unobtrusive photographing with roll film is the Nikon FM3a with a 50mm 1:1:4 prime, the tiny Nikon SB-30 and Ilford Delta 3200 which I set to 1600 and let develop according to specs. The push gives some extra “pop”. The standard focus screen K3 is a matte/Fresnel screen which has a (horizontal) split-image rangefinder spot surrounded by a microprism ring and a 12mm center-weighted area reference circle. This might be with me only though and other do not have any difficulties. Below a series of pictures which I took during an event on invitation only in Vienna where the key topic was to give speeches and everybody could volunteer. Completed by a game to rate different white wines and fabulous Swiss cheese, it was a very nice evening in a relaxed atmosphere. Mamiya NC1000s part 1&2 online! Part 3? Yep, will be there soon. Another important step in order to start repairing or servicing my camera collection has been achieved: The first batch of service and repair manuals have arrived this week from US based http://www.photobooksonline.com/ . Check out their webpage, they have an extensive assortment of user, repair and service manuals. Leon was very helpful when processing my order and in finding the most efficient way for shipping all the manuals from US to Vienna. Also, to my surprise, I did not have to pay any taxes, but maybe the invoice has yet to come. Anyhow, there will be a lot of reading and studying in the next time and eventually, I will need to select the camera I will do my first servicing attempt and it will very likely not be the Nikon F2 with its more than 1’500 individual parts. Welcome! This is my first post on the brand-new home-page, hosted by myself. My last blog was back in 2009 (!) on blogger.com. It was about the comparison of weight from different cameras. So many things have changed since then. I moved from Switzerland to Vienna in Austria and got married to an Irish girl. What remains constant is my undivided passion and interest for photography and camera gears. My collection of cameras has also expanded considerably and lately I am mainly shooting 35mm film. There are many things I want to share with you, such as my recent shooting experience with the (probably) first SLR that contains an electronic selfie function as well as a larger project where I will be digitising my fathers 2700 slides he was shooting between 1960 and 1980. So stay tuned for more content to pop up. I’ve been invited to a dinner yesterday evening and wanted to try out my Olympus OM-2N together with a Zuiko Auto-S 1:1.8 50mm and the electronic flash T32 with TTL flash metering. The OM2N is a compact SLR with a very quiet shutter / mirror sound. I don’t know if it was due to the good wine or due to being still a bit tired from an exhaustive Friday night but I had quite some troubles getting proper focus with this camera/lens combination. I tried again today comparing to a Mamiya NC1000s with the default 1:1.7 50mm: same issue on the OM2N but proper and fast focussing on the NC1000s. Strange. Maybe that it is time to visit an ophthalmologist. That was easy. Nothing beats the Nikon F100 with attached MD-15. The grip is great, the rubber texture almost makes it clings against your hand, the grip is thick enough so that you do not touch the camera body on the front with your finger tips. The Nikon D40 comes next but the rubber is missing and the grip not fat enough. But it is very light weight which makes it possible to hold it less tightly than the F100. The Contax is a monster. Holding it with one hand requires arms from Arnie and the rubber misses texture. Holding it vertically is not easy neither since it misses the bulky grip of an MD-15. The Mamiya is so light weight that even without grip, you can hold it without getting a cramp. I’ve also mounted the OM Winder 2 to the OM2N which has a nice grip that improves a lot the holding of the camera. However, there is a shoulder strap lug at the lower part of the grip which directly sticks in the heel of your hand. What an ergonomic nonsense! Also, the quiet shutter is gone, the winder makes a hell of a noise. It’s done! The Sigma DP-2 has been ordered. With a couple of accessories it sums up to a shocking CHF 1’280. I’ve spent several days reading through almost every available article on internet and came to the conclusion that this compact camera would be the ideal companion for my summer vacation on Canary Islands. I love shooting nature and buildings where I have a lot of time to fiddle with the settings of a camera, seeking for the best picture and of what I’ve read so far, the DP-2 ideally suits for this purpose. As indicated above, I’ve been looking for a compact camera, with focus on “compact”. I did not even want to bring my Nikon D-40 along, due to the amount of various lenses which I would have had to carry with me. Of course, I could have taken only a 50mm along, but once you’re there and like to shoot a vast landscape, you’d be upset that you have left the 28mm at home. The DP-2 is a big relief in that respect. 🙂 Furthermore taking the airplane also sets the limitation for weight of luggage and since I always take a few good books along, every kilo is worth thousands of words rather than bulky photo equipment. Choosing the DP-2 was everything except easy. Besides compactness, I wanted to have a viewfinder, manual controls, raw file output for post processing (especially white balance, where I’m not a spoiled kid with the D-40), rather less of zoom-factor than a fast lens, shooting up to ISO 800 with suitable color quality, external flash mount, manual focus and of course best picture quality for printing up to A3 format. I’m pretty sure that all above cameras are great and that the buyers are happy to own them. The Nikon would have been suitable since I already own Nikon stuff and I like the ergonomics of the D-40, the clear menus (of course I’m used to them in the meantime), the reuse of my SB-400 flash, the viewfinder and the robust looking built quality. One of the downsides is that Nikon has invented a new raw format (NRW) which would have forced me to update Capture NX to version 2.(2). The Canon G10 looks really great and it seems that it is really built like a “rock”. From my investigation, I could not really see any negative points, except that I would have had to buy a new flash. Except for the missing view finder, the Panasonic seems to have the best picture quality (according to various comparison tests). Let’s see how this new compact camera will do and I’ll certainly be back with my personal review about the DP-2 soon.